What do you call 10 tons of decomposed granite? I like grass. I know. I probably live in the wrong state. When I was a kid and lived in Texas for a couple of years, my brothers and I would mow lawns for money. It was great. 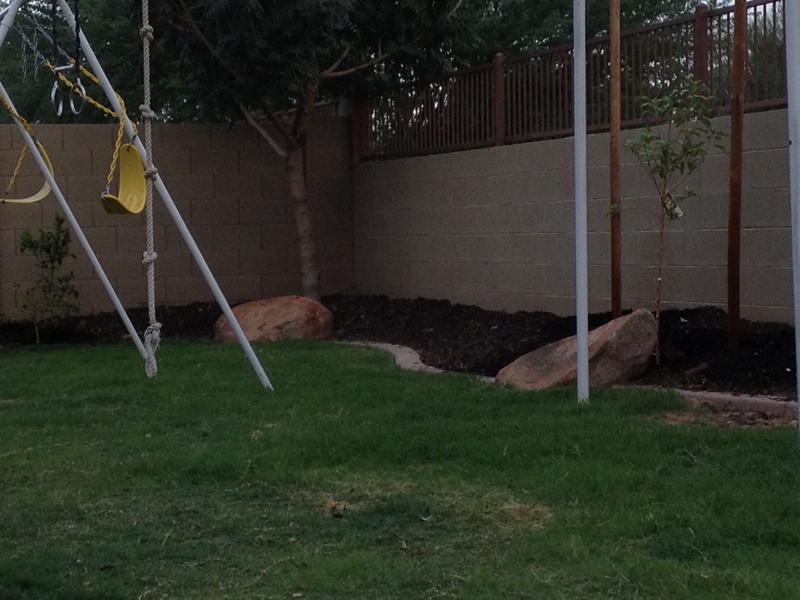 When we moved to AZ we thought we might try the same thing… then we realized none of our neighbors actually HAD grass to mow. That could be a problem. 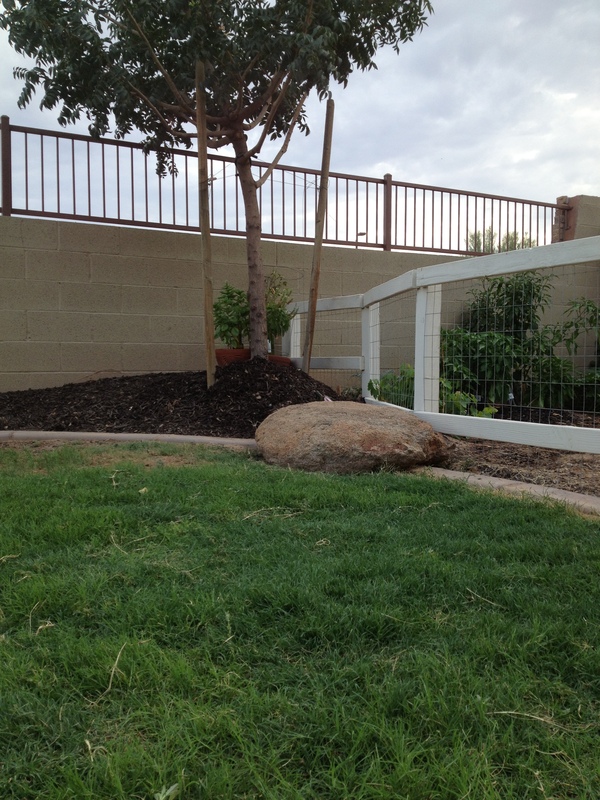 The most common landscaping in AZ is actually decomposed or crushed granite. You buy it by the ton, you convince all of your friends that this is the last time you are going to move and if enough of them show up it will only take a couple of hours. Then you buy pizza and you all take breaks every ten minutes to towel off as you move wheel barrow after wheel barrow onto the yard. When you’re all done it looks… like an idealized desert scene… sort of. Then it rains and you have weeds and grass and all kinds of nasty things pop up. That’s my front yard. I don’t spend a lot of time out there. I hate it. There was a chemical that had to go into the line that was an anti-rooting agent so that the grass didn’t grow into the line. It was bad stuff. It always made me nervous. Then a regulator broke. I fixed it, but when I did I busted a pipe… then the electrical line during excavation. So there it all sat, waiting for the weather to cool down. It cooled down a lot, in fact it froze, and destroyed my vacuum breaker. So it sat longer… a lot longer. Thankfully my wife is blessed with great patience. By the time I went to fix anything the old system was done. Roots had grown into the lines by now… before the grass completely died of course. But… I knuckled down in the worst part of June and July and got it done. Even planted the grass on July 3rd. Straight up grass seed (bermuda: Blackjack) is not easy to find by the way. Most of the seed is coated in fertilizers/antifungal/cellulose material to minimize the amount of seed per pound that they sell you. This entry was posted in grass. Bookmark the permalink. That’s funny, I have some friends and a neighbor who have artificial turf and they love it. I just can’t bring myself to do it, besides it still gets really hot when the sun is out. Plus I have big plans for my backyard that involve turning the whole thing into a garden eventually. I can’t see myself cutting astroturf out one piece at a time to do that. I’m with you, real grass or nothing, but that is easy to say from up here in Michigan. Keep up the good work. Jones, that’s why I live in Nebraska. My older kids try their best to get me to move to Las Vegas where they live. They claim the desert blooms beautiful. These kids grew up in the green grass of Nebraska. I think they have been away too long to remember what beautiful really can be. Sorry but palm trees are not really trees. I have indeed had to deal with those nasty vine things that have roots that go to China. I’m not sure what they are called but my oldest daughter had those in her back yard. We tried to get them all out and finally just gave up. Her back yard was that caliche stuff with rocks on top of it. The best that can be done with that stuff is just pile on more rocks and spray on weed killer. Have a great day in the grass? Every time I travel somewhere I notice how green it is when we land. Phoenix is not like that. It’s brown. A lot of houses, swimming pools, and dirt. That is an outstanding point, Judy. I have some friends from Minnesota and every time people start to belly ache about the heat, he says, “well, you don’t have to shovel heat”. Another friend pointed out today that it’s really not that bad for four months of the year, and absolutely perfect for four months. Just really hot the other four. He was a little more generous on the perfect count, but you get the idea. Thanks, William. There is nothing quite like the feel of cool, soft green grass on the bottom of your feet. Love it.